Gold Coin With Eagle Americana PowerPoint Templates And PowerPoint Themes 1012-Create stunning Microsoft office PPT Presentations with our professional templates containing a graphic of american gold eagle bullion coins. This template also contains an image of american eagle. It portrays the concept of america, currency, dollar, eagle, gold coin, liberty, money, patriotic, peace, power, pride, treasure, trust. This image has been conceived to enable you to emphatically communicate your ideas in your Business and Financial PPT presentations. The structure of our templates allows you to effectively highlight the key issues concerning the growth of your business.-Gold Coin With Eagle Americana PowerPoint Templates And PowerPoint Themes 1012-This PowerPoint template can be used for presentations relating to-"Us gold coin american eagle, business, finance, security, money, success" Question doubts with our Gold Coin With Eagle Americana PowerPoint Templates And PowerPoint Themes 1012. Download without worries with our money back guaranteee. 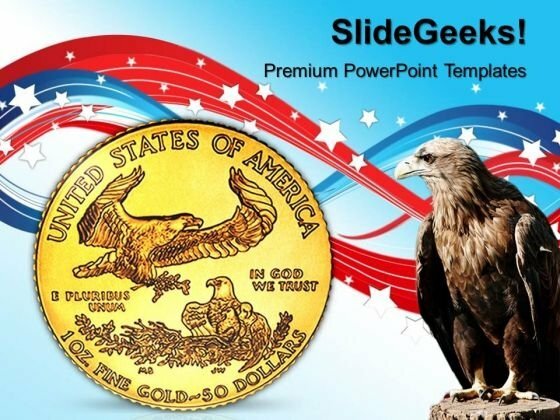 Our Gold Coin With Eagle Americana PowerPoint Templates And PowerPoint Themes 1012 believe in fair play. They adhere to the ethics of it all.